Medical Billing Services: Welcome to Comprehensive Healthcare Revenue Management! Medical billing can be overwhelming, especially if you’re a new physician just starting out or a small practice with limited staff. With local, state, and federal regulations and laws you have to follow, insurance company submission practices, and the overwhelming amount of patient information you have to keep track of, medical billing can be time-consuming and frustrating. When you outsource medical billing to a team of medical billing experts as a superb medical billing company such as Comprehensive Healthcare Revenue Management (CHRM), you’ll save yourself not only money, but also a ton of headaches. Medical billing experts are well-versed in how to submit claims, how to code medical services, and how to deal with denials and rejections. We constantly improve processes, invest in employee training, and work diligently to maximize revenue for your medical practice while you maximize patient satisfaction rate. If this sounds like the perfect solution to your otherwise head-butting of your computer at night, then contact CHRM today. Below, we’ll list the medical areas we specialize in and what makes CHRM the best medical billing companies. Contact us today! Oncology medical billing. Oncologists are the unsung heroes in the medical community. From diagnosing cancer to treating cancer, oncologists have some of the toughest jobs, especially when telling someone he or she has terminal cancer. CHRM has a department dedicated to oncology medical billing. Oncology medical billing is very specialized with hundreds of different services as well as infusion drugs to code for and bill for. When you have a team with years of experience in your corner, you won’t have to worry about your revenue cycle. Orthopedic medical billing. The doctors we rely on to put us back together after a sports injury or a car accident, orthopedists can treat a wide array of conditions with surgery. Anything having to do with the musculoskeletal system is in the orthopedic surgeon’s realm, which includes but is not limited to trauma, spine disorders, sports injuries, degenerative diseases, infections, tumors, and congenital disorders. Either surgery or rehabilitation is usually recommended as sources of treatment. With so many possible scenarios, orthopedic medical billing can become complicated fast. CHRM once again has a team of medical billing experts trained in orthopedic medical billing, so your medical billing errors will be minimized, and your practice can thrive. Free standing emergency services. A relative newcomer to the medical scene, free standing emergency services (FSERs) are cropping up everywhere these days due to their emphasis on patient care and service, as well as their 24/7 care. FSERs, while a type of emergency room, has unique challenges and thus, medical billing and coding needs. Following our guiding principles of integrity, transparency, honesty, and excellence, CHRM works tirelessly and diligently to ensure the medical billing and coding needs of FSERs are met and exceeded. If we’re not exceling, we need to know. We form close relationships with all of our clients in order to constantly be improving and to stay at the forefront of healthcare revenue services. Physician billing. While oncologists are the unsung heroes in the medical community, physicians, especially family physicians, are the heart and soul of the medical community. Charged with keeping families healthy, physicians invest themselves in their patients with no regrets, despite the inevitableness of life and death. CHRM works to streamline processes at doctors offices where mistakes often occur at the front entry point. We offer training of your front office staff in order to minimize medical billing errors from overlooked items, missing information, and even data entry mistakes. We offer up tips to ensure patient information is as accurate and up-to-date as possible, so the physician revenue cycle management is minimally impacted. Hospital billing. A vital part of any healthcare system, hospitals play a pivotal role in the health and well being of most Americans. Whether it’s an emergency over the weekend, or you’re seeking the best patient treatment for your child’s rare disease, hospitals offer up unique services that require a specialized team of medical coding to ensure medical billing errors are minimized. Hospital staff are often overworked and can become overwhelmed by the suffering they encounter on a daily basis. Processing a patient’s insurance information correctly takes low priority when the patient is a Level 1 trauma case. Patient care relies on both physician office personnel to excel. Other healthcare providers. CHRM also offers medical revenue services to other healthcare providers besides those listed above. From pediatricians to geriatric care, we run the spectrum of physician specialist clients. Our medical billing experts are proficient in all medical billing needs. We help all medical practitioners save money and increase revenue significantly with our technology and practices. 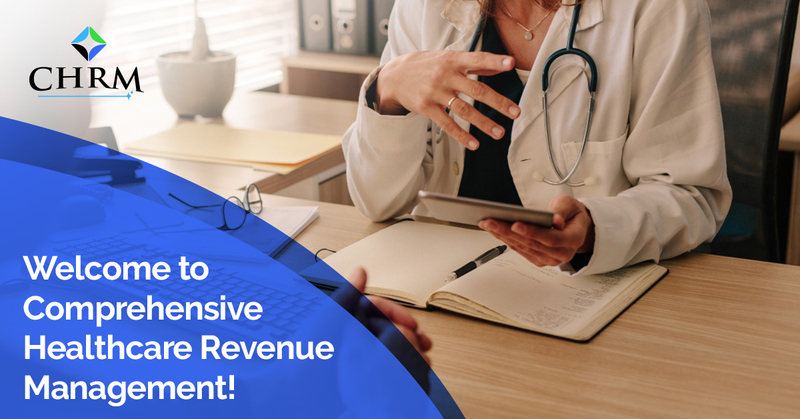 Comprehensive Healthcare Revenue Management (CHRM) was formed to better serve physicians, hospitals, oncologists, orthopedic surgeons, and FSERs with medical billing services that saves you time, money, worry, and stress. After all, if our healthcare providers aren’t happy and healthy, how can they make patients so? CHRM is a medical billing company that cares. Our clients are like family, and we do our utmost to form close relationships with our clients. We desire to make the lives of our clients easier by taking the worry off their plates when it comes to revenue cycle management. Our mission is to exceed your expectations, so you can continue to improve your medical practice. Contact us today for all your medical revenue service needs!